Click here to learn how the Captivator® System can produce 40% more biogas, use 40% less aeration energy and save 20% in capital costs! The Captivator System combines two proven technologies - Biosorption and Solid/Liquid Separation with an integrated control system that fine tunes performace and provides one operator interface. A VLR Aerated Contact Tank helps Biomass absorb the majority of soluble, colloidal and particulate organic matter within a short contact time. It acts as a modified contact stabilization process. 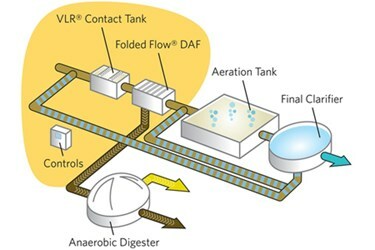 A Folded Flow DAF is utilized to separate the organic matter that is held within the activated sludge floc from the raw wastewater and transfer it to anaerobic digestion. This DAF thickens the sludge and eliminates the need for a separate sludge thickener. The DAF utilizes a high surface loading rate compared to primary sedimentation, and does not require polymer. The Captivator System also achieves higher BOD/COD and TSS removal compared with primary sedimentation. The control system optimizes BOD extraction under fluctuating raw water contitions and maximizes transfer of BOD to the anaerobic digester. Whereas a 30 MGD conventional activated sludge plant might use 1000 KW of energy for aeration, and only produce 500 KW of energy from biogas, a plant with the Captivator System would need only 600 KW of aeration energy and could generate 700 KW of energy from biogas. Capacity of a conventional anaerobic digestion plant can be expanded by adding a VLR Contact Tank and Folded Flow DAF in series to accept 50% or so of the raw influent. Biomass ladened with adsorbed BOD is sent directly to the anaerobic digester, while the liquid stream is sent to the aeration tank. In this scenario, plant capacity is doubled without additional primary clarifier or aeration tank volume, and biogas output is increased. The Captivator System is easily combined with other technologies such as a Dystor Gas Holder, a JetMix Hydraulic Digester Mixing System, or a low temperature Sludge Belt Dryer. Such Flowsheet Solutions save the engineer time in system design, and create project team efficiency through coordination of bid and construction issues that cross technologies.